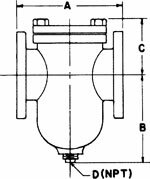 These strainers are recommended for use under moderate pressure and temperature conditions. With clean baskets, they offer excellent protection to pumps, valves, traps and other mechanical equipment. Self cleaning is done by opening the valve or plug connected to the blow off outlet. The body is constructed form Cast Iron (ASTM A126-B). The cover is HRS plate and the gasket is non-asbestos. All sizes feature a bolted cover with easy basket removal. Bodies can be supplied with tapings for pressure gauges. Sizes 3" & above feature slant baskets which allow for a straight through flow and results in extremely low pressure drop. For steam service, we normally furnish .045 perf up through the 10" pipe size. Above 10", we furnish 1/16" perf. 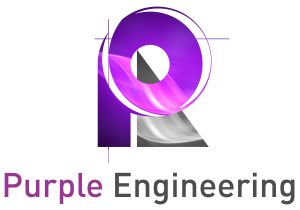 For water service, we normally furnish 1/16" perf for sizes up to 3", and 1/8" perf for 4" and up. Baskets are also available in other perforations and mesh linings in a variety of material such as Monel, Alloy 20 and Hastalloy. 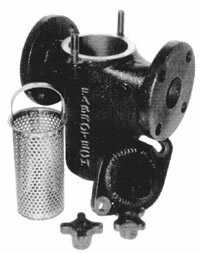 NOTE: For fine straining, we suggest model 125F. CAPACITY: Minimum 6 to 1 open area ratio. 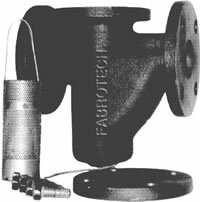 These strainers are used to remove foreign matter from pipe lines and provide inexpensive protection to pumps, meters, valves, etc. In appropriate material, the 125F series can be specified for drinking water, cooling water, sea water, etc.